Merle Mckenzie said he was driving along Route 9 in Berlin Thursday when he came upon an injured bald eagle. 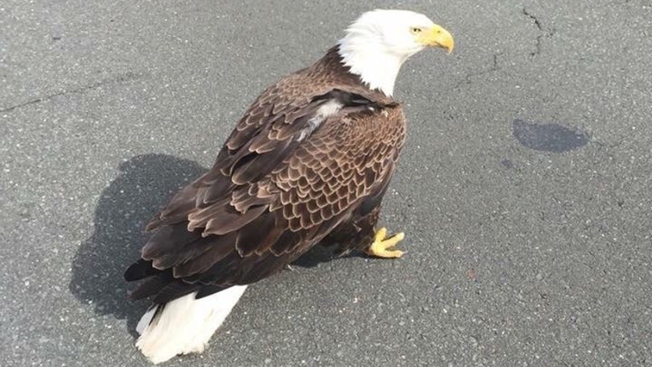 A couple of good Samaritans came to the rescue of an eagle on Route 9 in Berlin Thursday. Merle Mckenzie told NBC Connecticut he was driving on Route 9 north in Berlin Thursday afternoon when he spotted an injured bald eagle. Mckenzie said the bird had been hit by a car. The bird was dazed and appeared to need help. With help from a woman who stopped, Mckenzie wrapped the bird in a towel and put it in a cage to take it to a local animal hospital. Mckenzie said they took the bird to the Kensington Bird And Animal Hospital. The experts there examined the bird and determined it had no broken bones, just a scratch on the eye. The hospital plans to reach out to a rehabilitator to help the bird get back into the wild.